I traded e-mails with Miroslav over the past week, answering some questions about the software I actually use on a daily basis, rather than the software I see for an hour, write about, and then uninstall. Miroslav was interested in what programs actually earn the honor to reside on my personal systems. And since it’s the first day of a new year, and since there’s very little on my list right now that warrants the top spot of the year, and since it’s been a long time since I updated the software page on the old blog … let’s do it. Short of feeding you the results of yaourt -Qe, here’s the list of what appears on K.Mandla’s systems. You can interpret these as endorsements if you like, but you might just take them as a general nod of approval. alpine: The vanilla ice cream of the e-mail client world. alpine: My very first experiences with e-mail — the earliest actual interactions with e-mail that I can remember — were with pine, as part of a university e-mail system. My “mentor” sat me down in front of pine, showed me how to log in, and said, “Now you can e-mail all your friends.” The problem at that time (early 1990s, I should mention) was that none of my friends had e-mail. So I shrugged, thanked her, and went on with my day. 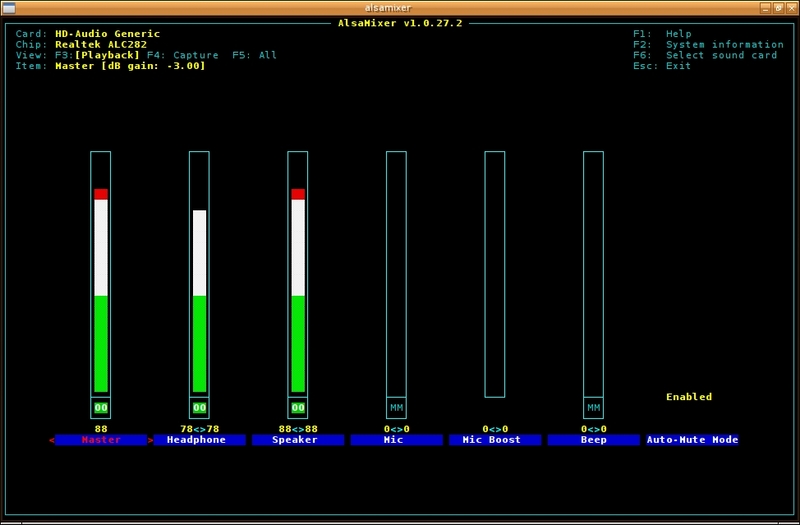 alsamixer: ‘Cause nobody can do it like mix master can! 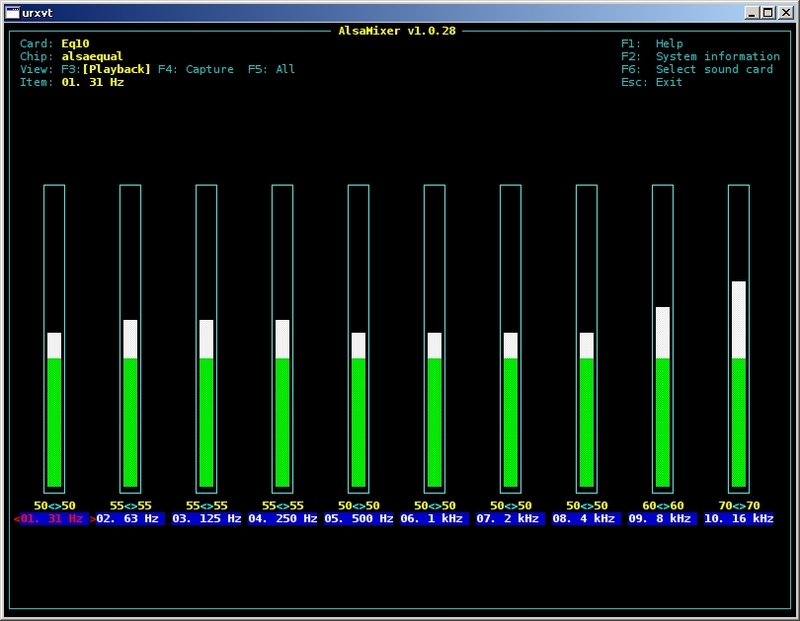 alsamixer: alsamixer is probably the most fundamental and easy-to-manage sound access tool in the alsa-utils suite, and my go-to tool when sound issues creep to the surface. Not only does it give you instant control over (almost?) every aspect of your sound hardware, but it might even point out a few features you didn’t know it had — like the 3D sound features of this ancient beast. dict: It pays to enrich your word power. dict: dict is simple, straightforward and powerful. It’s also simple, uninteresting and terrifically plain. 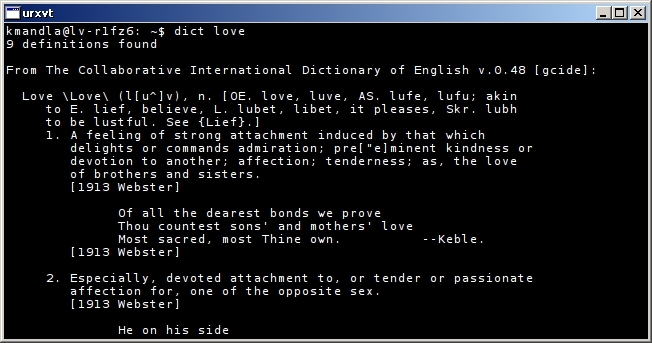 Give dict a word, and it will recurse all its dictionaries and reply with the results it finds. Thesaurii, computer dictionaries, Ambrose Bierce, name dictionaries, law dictionaries, translations — all of these are possibilities with dict, and there’s little more it wants from you than a word in question and a working connection to the Internet. gnupg: I wish we didn’t need this, but I’m glad we have it. gnupg: In this day and age, there’s almost no reason for me to include gnupg in this list. 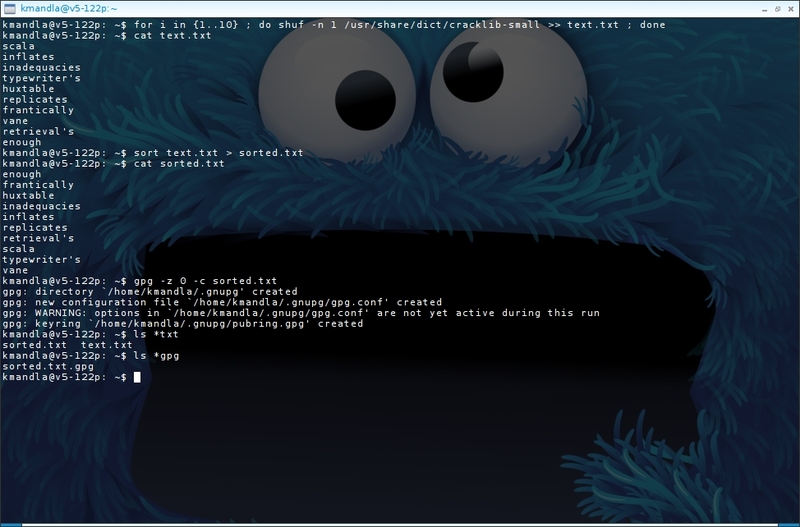 For one, gnupg is probably installed in every distro available, and so much of the web of software dependencies relies on it, that you probably wouldn’t get far without it. On the other hand, given the social and political climate of the world today, we’d all be fools not to look a little deeper into the basics of encryption and security. I gave a few ideas on how to use gnupg a long time ago, and I can tell you that I have used it for that exact same purpose, in that exact same way, within days of writing this because I planned some holiday travel and don’t trust the intermediary agencies that monitor it. gnupg is not the only method to protect your personal information from corrupt governments or unscrupulous criminals, but I’m confident that — when used properly — it’s one of the best. 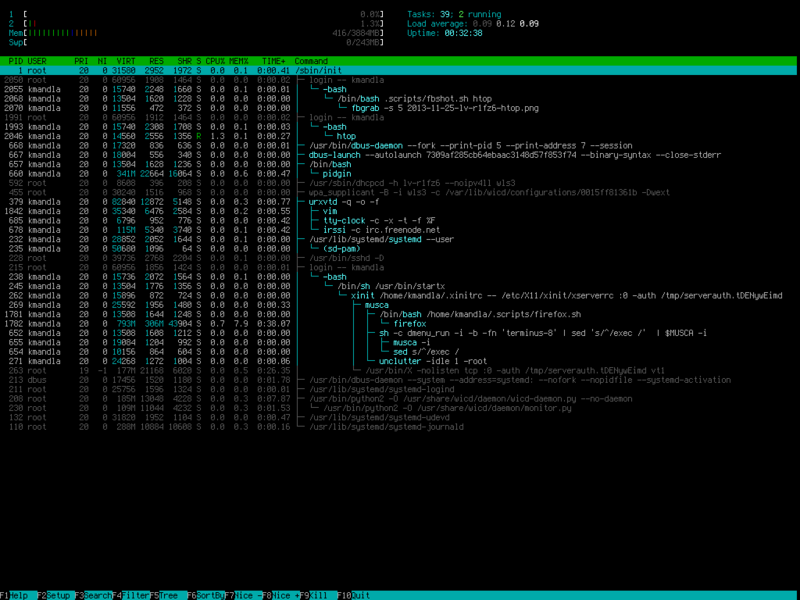 htop: Top of the *tops. 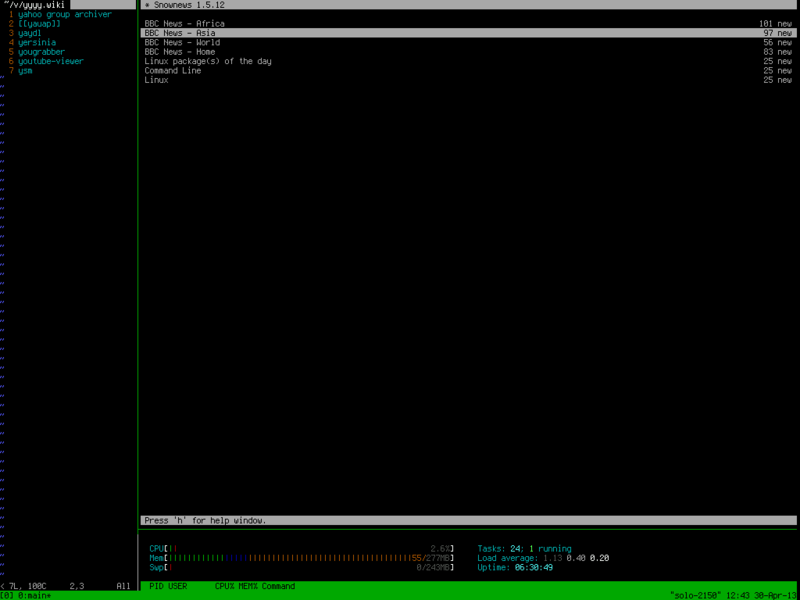 htop: I know, there are close to a million different system analysis tools for Unix, another million that serve as proper full-screen console monitors, and another million that piggyback the popularity of the traditional top tool by suffixing their names with *top. To that end, you have the choice of just about any *top, and it will deliver — with varying efficiency and helpfulness — a rundown on the subsystem of choice. 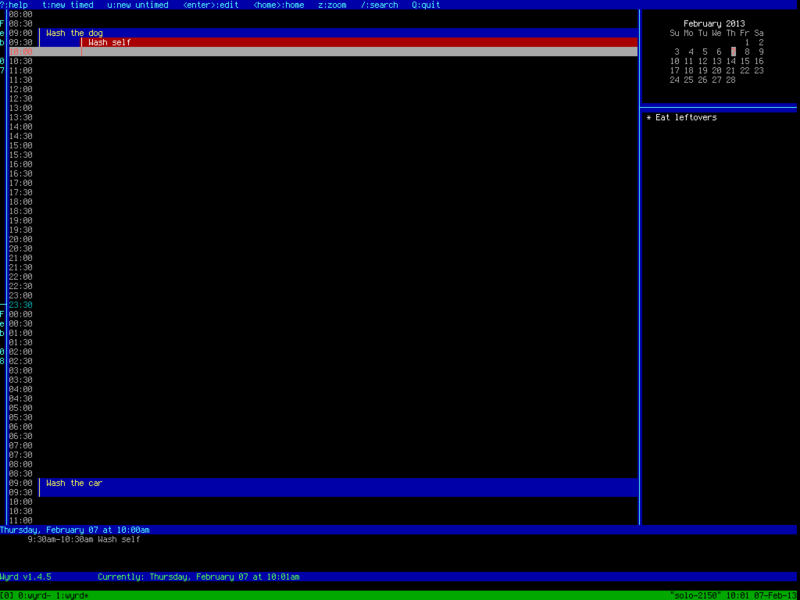 htop is the clear winner among system-wide status monitor tools, and the reasons for that are very simple and very easy to see, even by default: It uses the full space available to it. It doesn’t balk at small terminal sizes. It has a default color scheme that is attractive and logical. It keeps its controls in plain view. It can handle just about any hardware arrangement or software arsenal. And it’s customizable to a high degree, so if you’re not happy with its defaults, you don’t have space to complain. 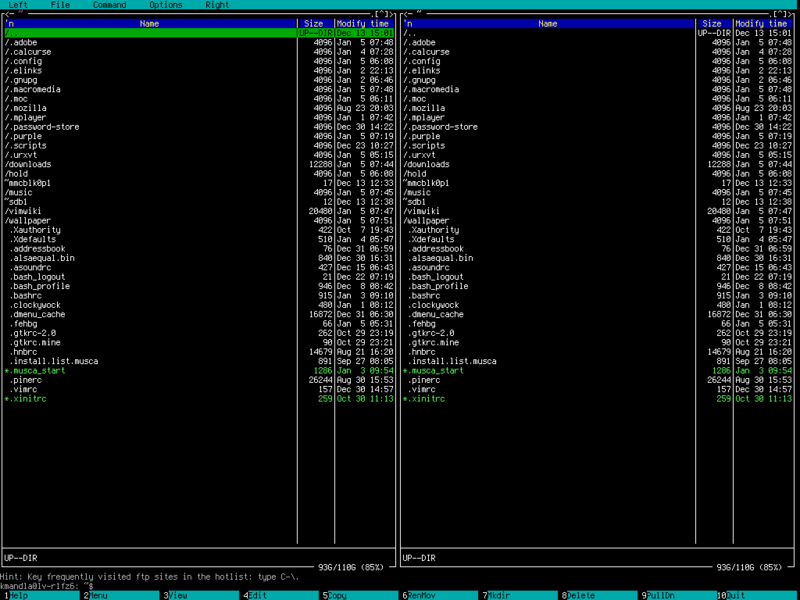 I say this rarely, but this time I think it really fits: If you need an example of how to make an effective, clean, useful and attractive console program, follow htop’s example. Midnight Commander: No need for introductions. Midnight Commander: There’s an expression that I’ve heard in English that says, “Never apologize. 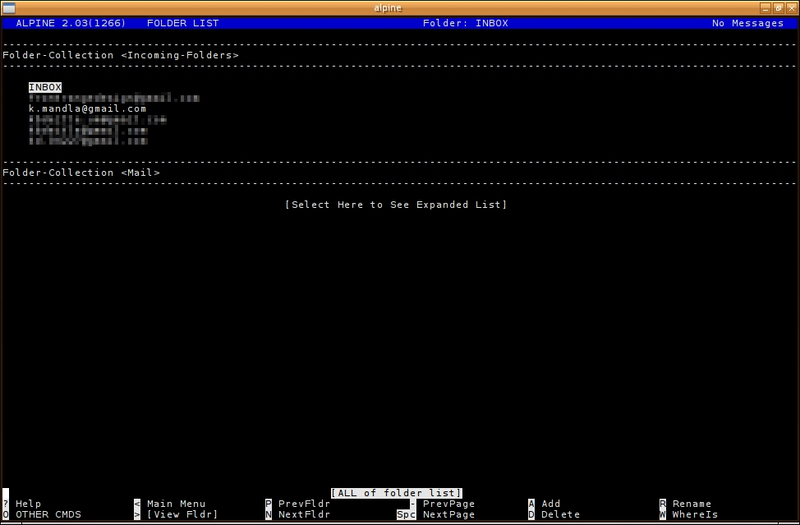 Your friends won’t expect it, and your enemies won’t believe it.” In the same way, there’s no need for me to try and sell you on Midnight Commander as a text-based file manager: If you already embrace it, you don’t need the explanation. And if you have another program you prefer, you won’t buy into my endorsement. I should mention though, that there is a self-professed contingent of text-based software users that claims to use no file manager at all, and that any interface whatsoever is an impediment to the core Unix tools for moving or copying files. That may be the case, or it may just be Internet bravado. I can only reply that there are situations where moving or copying is easier with something like mc, and I add to that the many unusual and interesting features and abilities that mc offers over a dull blinking cursor. Like color. 😉 Do as you will though. It’s your computer. Don’t do anything I suggest if it doesn’t appeal to you. mocp: Play that funky music, mocp. 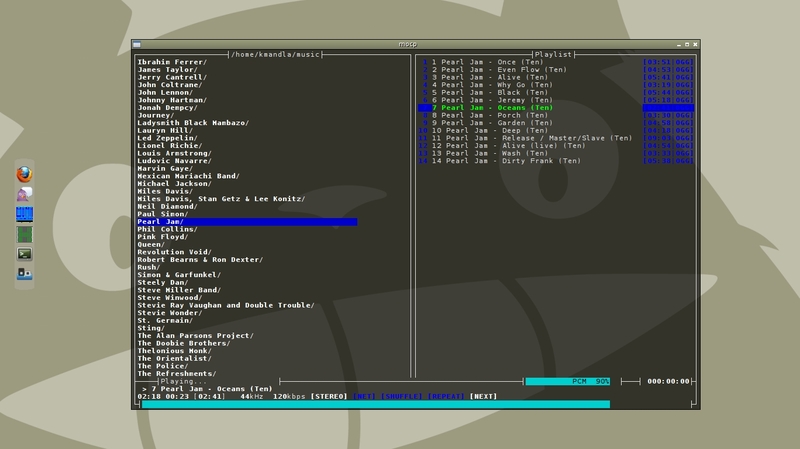 moc: This is where the list gets serious, mostly because the genre of text-based music player for Linux is so overdone, and so overfilled with random snippets of half-working audio playback code, that listing the command-line audio player du jour becomes a yawnable offense. There are quite possibly more random attempts at a text-based audio playback tool in Linux than any other software classification, and after spending years — years, I tell you, years — sifting through them all, there are more broken, incomplete and half-working thumbsuckers out there than there are worthy, competent and usable attempts at listening enjoyment. most: More than less and more than more. most: I suppose you could meander through your Unix lifespan with no $PAGER at all, or rely on just whichever one popped up in a moment of crisis. But all pagers are not created equal, and just because one distro relies on less at its core, that doesn’t mean there isn’t more available. And just because every pager tries to be more, doesn’t mean less is better or most is best. ncdu: I suppose I described my rationale for keeping ncdu installed yesterday, but reading that again makes me realize that my brief synopsis doesn’t really do justice to the tool. ncdu is perma-installed for me because it’s easier, quicker and more helpful than the original traditional tool , and does its job with so much more flair than the klutzy old du command. It’s true, I’m a sellout to anything that can throw a full-screen interface into a terminal window, splash a few colors here and there, and make me feel like I’m actually getting more out of my machine as a result. I suppose it should be enough to say then, that ncdu doesn’t use color and could be supplanted by a few core Unix tools, and I still use it. It is possible, after all, to invent a new way to approach a problem, and improve upon the old way of doing things. pass: You shall not pass pass. pass: Password “wallets” are a new arena for me technically, given that I only adopted pass as my password manager of choice a year or two ago. (Yes, that does make it a recent adoption.) pass has quite a few things going for it — mostly its straightforward style and Unixy approach, which I prefer for something as mission-critical as managing my avalanche of passwords. I will be honest and say that I am dearly torn between pass and yapet, which takes an altogether different approach and offers just about everything I really like in a console application. I have contemplated switching even just in the past year, because yapet has made tremendous advances since I first tested it. And I do feel a smidgen of hypocrisy in advocating for full-screen, full-color, interface-driven text-based software, but relying on something plain and CLI-based in pass. If I finally muster the gumption and make the switch, I’ll make a note of it here. renameutils: There are a lot of shortcuts to mass file renaming, and a few of those even have their roots in the core utilities that are available in almost every distro. renameutils wins my attention mostly for the qmv tool, which I have hard-wired into my system with an alias that calls specific options. Since qmv is bright enough to drop you straight into your $EDITOR to make changes, I can quickly rename huge gobs of files through my standard text editor, write out the changes, and qmv takes over the unenviable task of checking and renaming. Of course, that does mean that I don’t have a screenshot to show, since qmv is mostly transparent so long as you don’t make a mistake. It only pops up to warn you if you’re doing something stupid or impossible, and get your advice on what step to take next. And if qmv doesn’t fit your bill, there are a range of other tools in renameutils, and any or all of them could be winners. Install, explore, decide. sc: A legend in its own time. sc: In a few months I will be at a point where I must make a decision, to either stick with sc as my spreadsheet of choice, or use that moment as a jumping off point and switch to slsc. The context is completely outside the realm of this blog, with the exception that I’ve used sc for at least the past two years as a way of managing and calculating my data. Around May I won’t need it any longer, and can shift to slsc for future projects. All that aside, sc is pretty much my gold standard for text-based spreadsheets, and in spite of the fact that some sources date it back to the 1980s, I’ve never had a problem building, installing or running it. It’s light as a feather, has reasonable controls, saves its data as hand-editable files and to date hasn’t destroyed anything I have fed it. slsc would be an improvement and I think when the time comes I will shift to the newcomer (which is decades old in its own right), but for now, when it comes to a spreadsheet, sc is what I rely on. snownews: Snow news is good news. snownews: It’s odd that I have to mention snownews at all, but because of a real-life project that is vaguely related to sc, I also have to monitor some news sources, and snownews is a decent way I can do that. I don’t know if I can endorse snownews as The Best Possible Newsreader for the Text-based Environment, but that’s mostly because I haven’t used very many newsreaders, and don’t generally rely on them at all. So it’s possible that you see or use one that’s better — I know there are quite a few others out there — but for fundamental news access and reading, it’s a decent contender. Most functions are one-keypress commands, it can sort and label and categorize and otherwise manage feeds, and while I use it for maybe five or 10 addresses at most, I get the feeling it can do much more. I don’t hold much allegiance to it though and I’m not fond of all the perl dependencies, so if you know of one better, speak up. I might be converted. tty-clock: Rock out with your clock out. 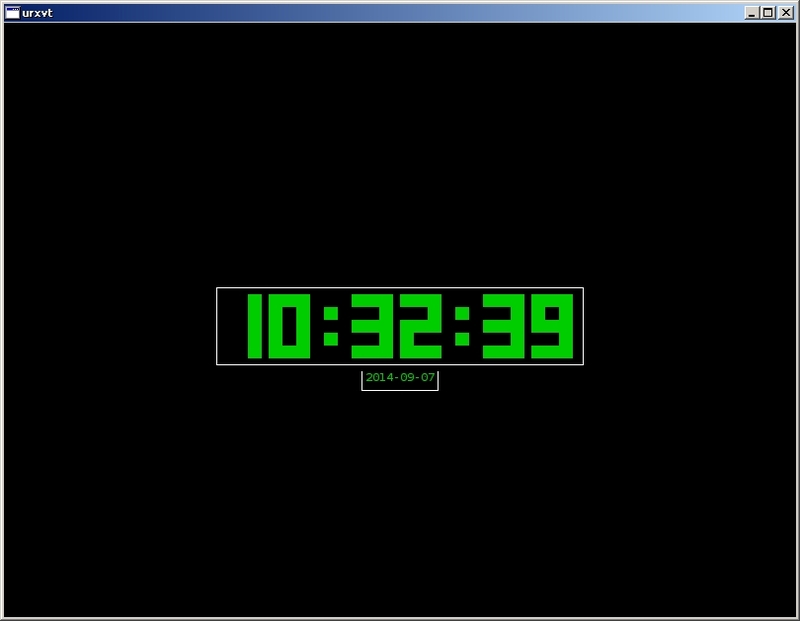 tty-clock: It’s been a long and interesting drama, watching tty-clock mature from a basic clock display to the text-based ubertool it is now. With plenty of options for color and behavior, and even more for formatting and display effects, tty-clock is a program I’m darned proud to have around, regardless of my window manager or desktop setup. I could endorse quite a few other clocks — clockywock is a great tool, and so is tbclock — but for readability, customizability and any other -ability, tty-clock is way ahead of the pack. Give this a one-key startup command, and you can pop it into place and back out again in a fraction of a second. Set it as a terminal screensaver and it can serve two functions. Run it in a corner of your framebuffer terminal emulator with the multiplexer of your choice, and other geeks will bow to you. It’s a win-win, plain and simple. tudu: I, for one, welcome our new text-based overlords. tudu: I wasn’t joking when I said yesterday that tudu ejected hnb from my system in a matter of minutes. I’ve seen and used more task organizers and to-do list managers than most people know about, and most of them fell by the wayside because hnb was so good and worked so well and ran so fast. But tudu covered every point hnb could offer (with the exception of one small feature, and I won’t tell you what it is), and doubled down by offering its own features and bonuses. Embrace, extend and exterminate. And in retrospect, that’s how I am when I see a program I like, can understand and find appealing. It only takes a few seconds to see the merits in switching, and given that tudu works, looks and runs a lot like hnb, I didn’t need coaxing. Perhaps that’s how software adoption should go. vimwiki: There but for the grace of vimwiki goeth vim. 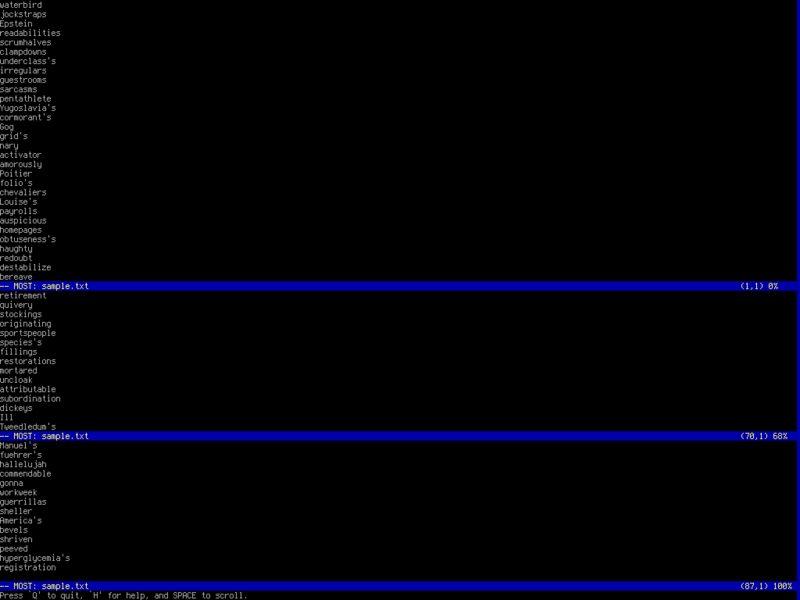 vim and vimwiki: It would be an understatement to say I have a love-hate relationship with vim. I have rarely met a program so counterintuitive, unfriendly or obtuse, and still taken the time to learn it. By all rights my interactions with vim, or its predecessor, should have lasted little more than a few minutes, before complete abandonment and dismissal to the software dustbin. It’s complex, arcane, and a complete antithesis to user-friendly software. wyrd: The sun is up, the sky is blue, it’s beautiful and so are you. wyrd: I used to rely on wyrd on a daily basis, for scheduling appointments down to the 15-minute interval, and it was a godsend. wyrd can track, manage and display a battery of regular or unique events, show them in a fully graphical arrangement and give you the ability to move and edit them as you need to. If it weren’t such a great text-based program, I’d assume it was intended for the graphical arena. Of course, the real wizard behind wyrd is remind, which handles all the real work involved in scheduling and managing your appointments. wyrd is the pretty face, and remind is the ugly machinery. You can’t take advantage of wyrd without remind, but remind without wyrd is unappealing to the same degree. For sheer muscle and ease of use, wyrd beats out just about every other calendar and timetabling tool, even for small tasks. Don’t be afraid to use it. The last tools I could mention are unique to specific hardware or distros — things like yaourt for Arch systems, or ssh for secure access, or ntp and cron for machines so old that they can’t keep time properly. I could mention them as well, but some systems use them at regular intervals, and some use them once a month. It’s hard to say, and so they’re probably not worth mentioning. This entry was posted in Linux on 2015/01/01 by K.Mandla. Thank you for the list. Miroslav beat me to the question. I’m actually planning on making a system like this now. I love reading your posts and information. Please keep up the wonderful work. Blessings to you in this new year. Regarding offline dict: it isn’t hard to set up a dict server on your own machine, with the dict files you use most often, and have dict look to localhost before looking further afield. Awesome list! I am currently in the process of setting up my environment based upon GTD concept and am reading your blog like Bible each night before going to bed! 😀 This list is reallu helpful and appreciated! Thanks and keep it rolling in 2015 too!